"It's the game designer's job to evoke different sides of humanity"
It's hard to believe it's been 11 years since thatgamecompany was founded and more than five since the studio launched its influential PlayStation 3 title Journey. Thatgamecompany's unique approach and emphasis on player emotions resonated with gamers, and Journey - which became the fastest-selling game on the PlayStation Store - helped spark an entire indie movement for PlayStation. With its fourth title Sky, which was teased for the first time during Apple's iPhone X unveiling, thatgamecompany is hoping to take its design philosophy to an even wider audience by leveraging mobile platforms. Like Flower, Flow and Journey, Sky continues thatgamecompany's non-violent ethos. In fact, not only is Sky a peaceful game, but it's one that encourages sharing and positivity - something that's sorely lacking in many of today's video games. Jenova Chen, co-founder and creative director at thatgamecompany, tells me, "I hope that we can make games that can be loved by everyone. That's not the status quo right now, but that's why we are excited to come to work at thatgamecompany every day to build a global social adventure experience in Sky. "A big point is that we believe games are a form of entertainment media that should appeal to different audiences, through different emotions. The only way to expand the game industry and the audience in it is to design games through different emotions that appeal to more people. We are not short of the action/adventures, thrillers, horror games and other big AAA titles in the industry. The games with shades of violence have been done, and done very well. For us to make a violent game, it does not add anything or help the industry, and so we want to push for new emotions that haven't been done before. We want to design for games that carry positive behaviors that highlight other spectrums of human nature and make those games interesting and appealing to more people." "We want to explore this mechanic of exchange as a way to promote appreciation and generosity, and to see if we can build out a business or monetization model that comes from positive behaviors, through supporting each other and sharing"
Importantly, for thatgamecompany, player emotion isn't something that has to come from a linear narrative. Where Chen sees emotion playing an integral role is actually in social dynamics through gameplay itself. "The most important thing in evoking emotions in video games as a medium is to treat gameplay mechanics and the player dynamics in a multiplayer game as an instrument that contributes to the overall storytelling," he says. "Sometimes games have a story, in a shooting game for example, but the shooting doesn't contribute to the instrument's music; it just plays a flat note throughout the storyline. In the case of a racing game, you replay the same race a hundred times. If games could be compared to movies, television...theater, and a combination of other media - then [all components of the game] should work together like an orchestra and play in harmony to make the story stronger. "Through Flower, we experimented by using basic gameplay to bring to life the emotional highs and lows of the petal and its environment. In Journey, we used two-player dynamics to strengthen the story. For Sky, we are working on a multiplayer game for the first time where we are designing for more than two people. The 'group dynamics' is what we will be looking towards to make the emotion and the story arc stronger. So the social dynamics between the players is what we are experimenting with right now." A big part of that experiment revolves around encouraging the spirit of giving. 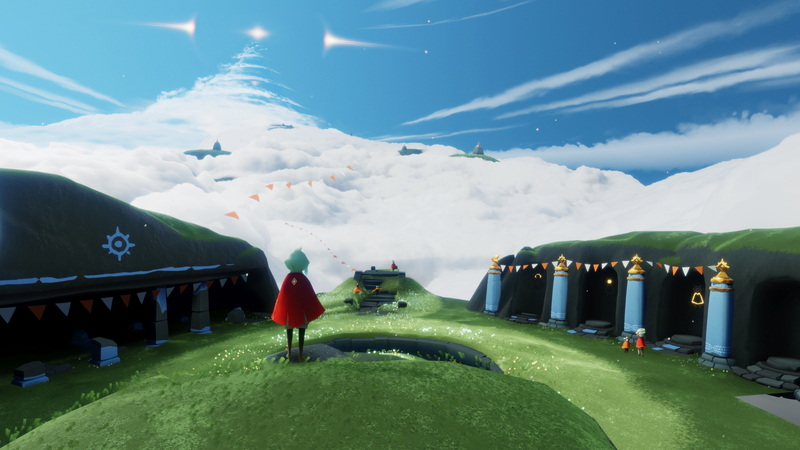 With Sky, thatgamecompany wants to find out if players can be motivated by sharing and gifting as a play mechanic. Can altruism really be leveraged as a business model? Chen thinks so, but it's something he and his team are keen to find out as they examine players' actions in the upcoming Sky beta. Can Sky prove that altruism works as a business model? Chen points to how gifting is actually a common practice in human society and "had a place in history across different cultures before the rise of the modern economy." He continues, "We believe that gifting is still a universal and emotionally 'pure' and 'simple' act within humanity today. As we kick off the beta tests, we want to explore this mechanic of exchange as a way to promote appreciation and generosity, and to see if we can build out a business or monetization model that comes from positive behaviors, through supporting each other and sharing. "In many modern day free-to-start games, players who spend irrational amounts of money in-game are celebrated... But from a gamer's perspective, this pay-to-win mechanic feels quite unfair. So we really want to encourage a free-to-start community where the most respected players are not necessarily the ones who have spent the most money, but they are the ones who have garnered the most respect through their in-game compassionate actions and behaviors. That's our hope." One look at online game communities and it's not hard to find toxic behavior that ruins the experience for others. Even with this rise of toxic player behavior, however, Chen continues to believe in the good nature of most gamers today - even the ones that might seem toxic under certain circumstances. Chen puts the responsibility squarely on developers' shoulders to bring out people's good side. "During our time developing Journey, we discovered that it wasn't the gamer who is mean or toxic, but it was the way the game design had put the players together in a situation that triggers toxicity"
"During our time developing Journey, we discovered that it wasn't the gamer who is mean or toxic, but it was the way the game design had put the players together in a situation that triggers toxicity," he explains. "What we discovered at the time was that the same players who were toxic in a competitive community were actually very nice and considerate in the community of Journey. When we slowly changed what was possible between the players - how frequently they saw another player, or how the environment could impact them - we immediately saw a change of attitude between the gamers. "I really believe it's the game designer's job to evoke different sides of humanity when the players participate. For our games, we aim to share positive aspects of human nature. This is why we spend a lot of time testing and deciding what we should be emphasizing or avoiding in the design, so that the players behave differently and more positively in the community." This is an approach to player behavior that the developer is fine-tuning for Sky, which reinforces that the players actually need one another to progress. "For Sky, we are working to designing a world where the players will have to depend on each other to fly or traverse through different parts of the kingdom," Chen adds. "They can try and go it alone but they will find that they will gain more support or access to the world if they are exploring further together cooperatively. Something we are also testing is how the relationship level and strength of the bond between players can inspire compassionate play. It is early but we are exploring some of these elements." With the help of Annapurna Interactive, thatgamecompany brought Flower to iOS in September, but that game obviously wasn't built from the ground up for mobile devices. With Sky, which is debuting on Apple platforms first, thatgamecompany is making a sort of mobile pivot. The studio sees huge potential in mobile, not just because everyone has a smart device these days (making the addressable audience vastly larger), but because mobile is a platform that's far more accessible to anyone. With a game like Journey, while a "non-gamer" in the family may be interested in the experience, the video game controller instantly becomes a barrier to adoption. "Our wish is to make games that allow families to play together, and the mobile platform easily allows for gamers to enjoy it with their friends and loved ones... So we hope to bring people closer," Chen says. "It won't just be on mobile though; the game will also be cross-platform. We want to make the game available on many platforms, so if you love the game, you should be able to play it easily with others." Chen isn't sure which platform will follow Apple, whether that's Android, PC or console, but ultimately it doesn't matter. "We ideally want Sky to be as readily available as possible... The platform is not the focus but the solution to distribute our games," he notes. Not only is the goal for Sky to be cross-platform, but Chen thinks it can be cross-generational. He comments, "If we succeed, this will be the first time we have released a game where families are playing together, children are playing with adults, boyfriends are playing with girlfriends, etc. We feel we will only be partially designing for their gaming and emotional needs at the moment because there will be things that we cannot foresee ahead of time. "So the beta test will allow us to ask, 'How can we make this experience more worthwhile for them and the casual gamers, family or friends who they invited along and are less familiar with games?' We would love to collect as much feedback as possible to make it a more enjoyable game world experience, and to be able to evolve what's possible in games in order to earn the respect of these mobile users who are playing games for the first time." In an industry where open development has become more and more common, player feedback has become a key to success. Knowing what to do with that feedback is a crucial skill, and it's something Chen is very much looking forward to with the Sky beta. "Our studio sees the alignment of offering more meaningful and enriching games to those who play games on mobile, but we also need to find a new way for the players to feel respected and not resent the game creators"
"On a granular level, feedback has always been key to the development of all of our games," he stresses. "For Sky, we will be reviewing beta feedback and data from a wider pool of players who are playing online in the game together. So we anticipate reviewing more varied responses than before. For example, we may analyze how intuitive the controls and player experience is, [or] how they are able to read non-verbal elements of the world. When are the occasions where they do or do not respond to moments of social dynamics, teamwork or compassion? All of these results and much more will help us determine if they are responding to the overall emotional experiences in the game, and if they deem the game adds meaningful social memories that bring them closer to their friends, family and community." Although the mobile sector has come a long way since the gold rush that accompanied the early iPhones, Chen believes it's a very young ecosystem still, and it's one that's perhaps not benefitted from designers' best intentions. Free-to-play has revolutionized mobile (and games as a whole), but microtransactions have unfortunately also led to some mistrust of the developer. "I think we are still in the very early stages of what mobile platform games can offer," Chen remarks. "I would say the audiences who adopted mobile games in the beginning were not traditional gamers, and so the free-to-play market grew into this genre of parlor games that exploited its players with titles designed to take advantage of the novice players' weaknesses. This led to the overall audience resenting the mobile games industry a little, because they haven't had consistent quality experiences that allowed them to build trust, respect and loyalty with the game studios to begin with. They were burned out." Naturally, thatgamecompany wants to be part of the solution on mobile in the way it's developing and monetizing Sky. Chen continues, "Not everyone wants to approach games on mobile in this way; there are game creators who believe in connecting with the audiences through quality experiences. With Sky, we are excited to play a small part in helping with this. We all have to invent a new approach and gameplay that looks to change what's possible in monetization and the way the industry can do it. Our studio sees the alignment of offering more meaningful and enriching games to those who play games on mobile, but we also need to find a new way for the players to feel respected and not resent the game creators. That's why we are experimenting and trying to explore and re-invent how free-to-start experiences can be done." Of course, free-to-start presents its own challenges, as Nintendo found out with its free-to-start Super Mario Run, which has been commercially disappointing. Nintendo did an about face with its recent free-to-play Animal Crossing release, but clearly thatgamecompany believes free-to-start can still work. It's going to be interesting to see how Sky's received. And while games are a business, and studios need to make money to keep doing what they love, it's Chen's creative passion and desire to evolve games that shines through. 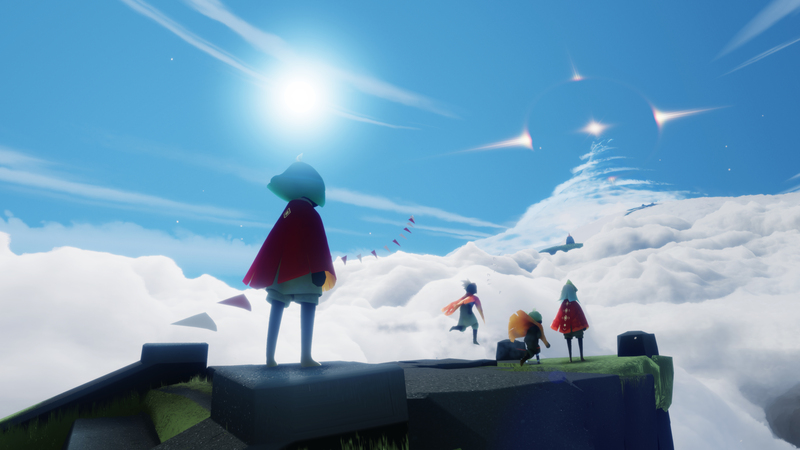 His advice to other indies that look to thatgamecompany for inspiration: "I think [they should] try and focus on the bigger good of the industry... Focus on what would make games better, or different, and would make our industry more respected. I believe a game that creates positive value to the industry or society will realize financial value as well. "Otherwise, I think treading on the same path that other game creators have paved is easy, but the reality is that it's much harder for upcoming developers to surpass their previous work. This is why indie developers should work towards making a new mark on the industry, and look to trailblaze a new path by leading the community and audiences to a new kind of gameplay. Only by pushing the boundaries of what games can be, by combining a new kind of gameplay with the depth of a known experience, can a new approach be realized. Thatgamecompany has never let its projects get too big or bloated, and Chen sees that as a vital piece of advice for fellow indies, too. "It's important to keep the scope of the game small and focused," he says. "Content can very easily grow too big and too expensive [and then] they can no longer make changes half way. The smaller the scope they make, the more freedom they will have to experiment and throw away things that doesn't work. Reiteration is key. This will allow them to find something truly new and different, so they can stand out against the rest." Great read! I'm a big fan of Jenova Chen and thatgamecompany. I hope they succeed in attracting a larger audience and inspire other developers in the process. Thanks Mbuso. And I agree - they have a wonderful approach to development.